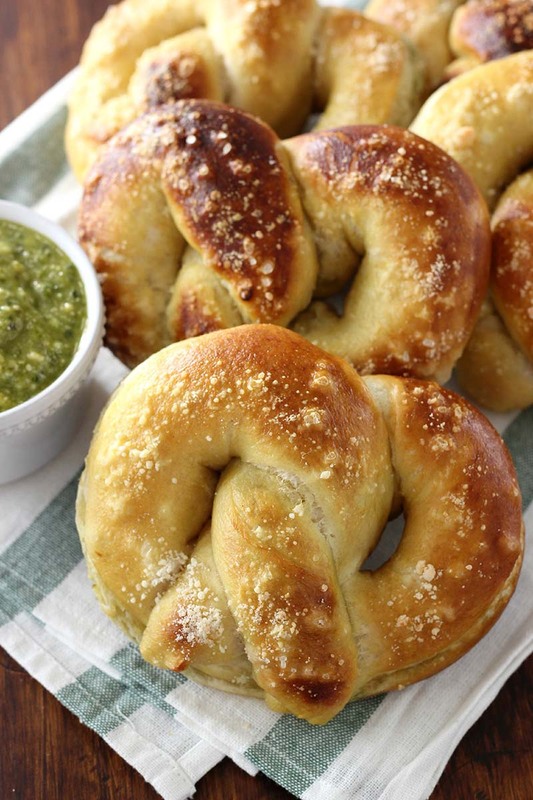 Chewy soft pretzels stuffed with a creamy pesto Parmesan filling! In the bowl of a stand mixer, combine 3 cups flour, yeast, sugar, and salt. Add water and butter. With mixer on low, add additional 1½ cups of flour. If mixture is still too wet, add up to an additional ½ cup flour. Beat with paddle attachment until dough starts to form. Switch out paddle attachment for dough hook and knead dough on medium speed for 5-7 minutes or until dough is smooth and pulls away from edges of bowl. Shape dough into a ball and place in a large bowl that has been sprayed with olive oil or non-stick cooking spray. Roll dough in the bottom to coat all sides. Cover and let dough rise in a warm, draft-free spot for an hour or until doubled in size. While dough is rising, prepare filling. Stir together cream cheese, pesto, and Parmesan cheese until well combined. Preheat oven to 425°F. Line a baking sheet with parchment paper or a silicone baking mat. Bring water and baking soda to a boil over medium heat. Beat egg in a small bowl. Turn dough out onto a lightly floured surface. Divide into 8 equal pieces. Roll each piece of dough into an approximate 20 x 3-inch rectangle. Spread about 2 tablespoons of filling along the bottom of rectangle. Gently roll dough up lengthwise into a rope, pinching ends tightly to prevent filling from spilling out. Gently roll out 1-2 more inches. Shape into a pretzel and press ends down. Gently place pretzels one by one into boiling water. Allow to boil 50 seconds, flipping them halfway through boiling time. Place on prepared baking sheet. Brush beaten egg over the top of each pretzel. Sprinkle with salt and Parmesan cheese. Bake for 12-15 minutes or until pretzels are golden brown. Allow pretzels to cool for at least 5 minutes before eating.